16-year-old recognised for raising over £300,000 for charity! Jonjo Heuerman is a remarkable young man who, at the young age of 16, has already raised over £300,000 for charity. Since sadly losing his grandmother to bowel cancer in 2009, JonJo has taken it upon himself to fundraise by completing various challenges across the UK. He has recently been recognised for his efforts with a Jack Petchey Foundation Achievement Award at the Orchard Theatre in Bexley. JonJo, a student from South East London, first started raising money at the age of nine, just after losing his grandmother. The young boy decided to fundraise for The Bobby Moore Fund for Cancer Research UK. JonJo chose this charity as he is a big West Ham United fan and specifically a big fan of Bobby Moore, who he knew had also passed away from the same disease. Whilst it’s said football is a game of two halves this young fundraiser certainly does not do things by halves. For his first challenge, at the young age of 9, he completed a walk from Wembley Stadium to The Champions Statue outside West Ham United stadium. The journey was completed over three days, and he was accompanied by friends, family and many supporters cheering him on the whole way. Since then, the challenges have got bigger and bigger. He has dribbled a football from Southend United to the centre circle of West Ham United, cycled and walked between all of the UK’s Premier League stadiums and in 2016 he completed a 450-mile challenge to celebrate 50 years since England won the world cup! For each event he wears a shirt with the names of ‘angels’ printed on it – these names are sent to him throughout the year from supporters. The angels are people who have passed away from cancer. Each year JonJo holds an angel ceremony where he reads out all of the names in front of a large audience. These incredible efforts were recently celebrated at a Jack Petchey Achievement Awards ceremony. 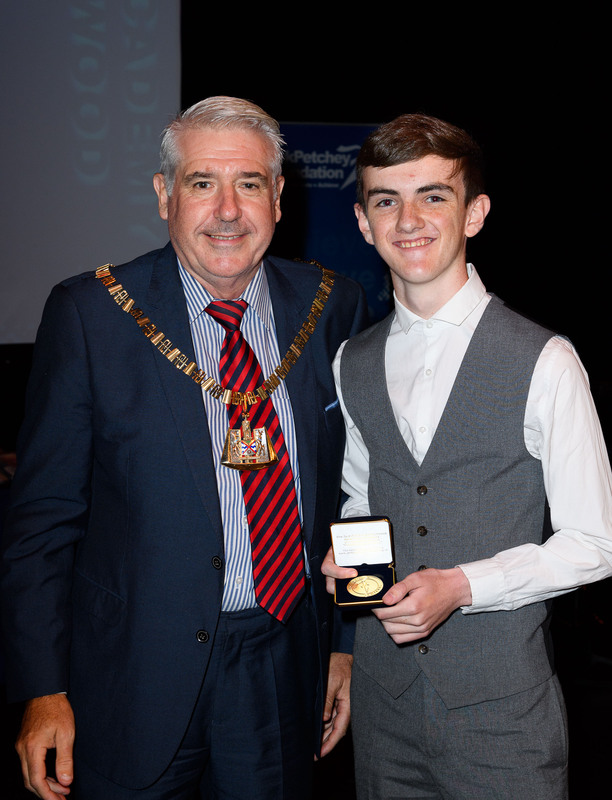 Along with various other young achievers from Bexley, he was presented with an award by the Mayor of Bexley. As well as receiving an award, he was also given a £250 grant to spend how he wished at his school. JonJo decided to put it towards the Diana Award Anti-Bullying Training Programme for his class. This is not the first time his efforts have been recognised. In 2016 JonJo was the youngest recipient of an award in the New Year’s Honours List. He, coincidentally, received his award in the same year Sir Jack Petchey CBE, who founded the Jack Petchey Foundation, was knighted. JonJo received the British Empire Medal for his contributions to charity. He has also been awarded with a Points of Light Award, British Citizens Award and is one of only 20 worldwide recipients of the Diana Legacy Award. JonJo’s fundraising has had a huge impact and his challenges only get bigger every year. As well as making a difference through fundraising, JonJo also delivers speeches at football stadiums in front of huge crowds. He spreads the word of his charity efforts through talks at schools and youth clubs, which help to encourage other young people to get involved in fundraising and doing something to make a difference.